(Nanowerk News) Jesse Sullivan, a double amputee from Dayton, Tenn., has been called the world's first "bionic man" with his thought-controlled, state-of-the-art prosthetic arm. He can eat with a fork, pick up a cup, paint his house or guide a weed eater by bending his advanced appendage's elbow and rotating its forearm. But he still cannot grasp and throw a baseball, cast a fishing line, tie his shoes or type on a computer keyboard as naturally as before. That may change with the help of numerous organizations including Oak Ridge National Laboratory (ORNL), some 50 miles north of Sullivan's hometown. In 2001 while working as a utility lineman, Sullivan lost both arms after a 7000-volt shock in a power-line accident. Physicians at the Rehabilitation Institute of Chicago (RIC) reattached nerves from Sullivan's amputated arm to his chest muscles, which were connected electronically to the prosthetic arm. When he thinks "close hand," electrical signals released as his chest muscles contract are picked up by electrodes in the prosthesis. The electrodes relay the signal to a computer chip that commands his electronic hand to close. Northwestern University's Prosthetics Research Laboratory developed this thought-controlled arm. Sullivan is now testing an even more advanced prosthetic arm that allows him to pull a credit card from his pocket and stack cups by controlling grip force. This next-generation prototype was designed and built by a team of multiple organizations through funding from the Defense Advanced Research Projects Agency (DARPA), the U.S. Department of Defense agency responsible for development of new technology for use by the military. DARPA has been funding two programs to create a fully functional upper limb that responds directly to neural control. The motivation for this demanding research project is the growing number of American soldiers who have lost limbs while serving in Afghanistan and Iraq. The first DARPA program, Revolutionizing Prosthetics 2007, is led by DEKA Research and Development Corp. The objective of this two-year program has been to design and fabricate an advanced prosthetic arm and hand using the best available technologies. The second program, headed by the Applied Physics Laboratory (APL) of Johns Hopkins University, is developing enabling technologies that will give the next-generation prosthetic the properties of a biological arm, so the amputee can feel and manipulate objects naturally. This aggressive, four-year program requires breakthroughs in neuroscience, robotics, electrical power, sensing and actuation technologies. 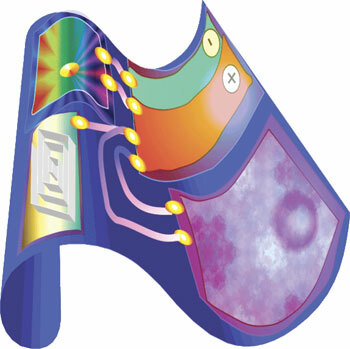 While Sullivan and others test the first DARPA prototype, two ORNL groups and dozens of other organizations are developing candidate technologies for the second prototype, which will be completed in late 2009. Art Clemons serves as the liaison between the ORNL groups and their DARPA program managers, as well as APL, the program's system integrator. Sullivan's bionic arm and DARPA's first prototype both have electric motors that provide seven degrees of freedom, or independent movements. But John Jansen and Lonnie Love in ORNL's Robotics and Energetic Systems Group are developing a new technology, mesofluidics, that could provide actuation to prosthetic finger, thumb, wrist, elbow and shoulder joints, conferring the strength and speed of a natural arm and hand. Mesofluidic technology is more compact and offers more force and speed capacity than electromagnetic actuation in today's bionic arms. Love and Jansen have demonstrated this technology on an elbow capable of 60 foot-pounds of torque. They are developing a prototype finger that has 20 pounds of pinch force. The researchers designed and built a one-inch-high pump driven by a tiny electric motor, compact valves to control the flow of mineral oil or other fluid and actuators, such as pistons in cylinders into which the fluid is pumped at a pressure of 2,000 pounds per square inch. Powered by a rechargeable lithiumpolymer battery pack, the pump compresses and displaces the fluid. As pressure builds up, the oil forces the piston to the cylinder's end, causing the elbow or finger joint to bend. "DARPA wanted to know if we could build an artificial arm with elbow and wrist joints that could curl 60 pounds using mesofluidic technology," Jansen says. "Most humans cannot lift such a weight using elbow and wrist power." "The 60 foot-pound elbow torque milestone was a classic ?DARPA hard' objective that many researchers thought unachievable," Love says. "We met this DARPA milestone by demonstrating the power and strength attainable from mesofluidic technology." Electric-motor systems are inefficient as prosthetics partly because they require extra energy for accelerating and braking the arm's movements. "The energy used by our prosthetic arm bending at the elbow is 21% of the input energy supplied by our battery-powered, miniature hydraulic pump," Jansen says. "That is the same energy efficiency as human muscle." Another DARPA objective met at ORNL is finger pinch force, which results from pushing any finger hard against the thumb. Love and another robotics engineer, Randy Lind, designed a mesofluidic finger using aluminum pistons and cylinders connected by tiny valves. "Our next goal will be to demonstrate that a mesofluidic finger can exert 20 pounds of pinch force," Love says. "This design shows that compact, high-strength actuators and valves can fit inside the volume of a finger, an important benefit of mesofluidics." The DARPA hand will have the human hand's dexterity and 24 degrees of freedom. "Our prosthetic fingers will be designed to move at the same speed as human fingers," Jansen says. "Other researchers are working on providing electrical feedback between the brain and finger joints, to enable military amputees to resume their normal activities, from pulling a gun trigger to typing on a computer keyboard." FILMskin will sense heat, cold and pressure. ORNL materials scientists are collaborating with National Aeronautics and Space Administration researchers to produce a flexible, integrated, lightweight, multifunctional skin, or FILMskin, for a next-generation prosthetic hand and arm. The team's challenge is to make a revolutionary skin that will outperform current prosthetic coverings in properties and functionality, allowing the prosthetic wearer to feel heat, cold and touch. Ilia Ivanov and Dave Geohegan, both of ORNL's Nanomaterials Synthesis and Properties Group, are collaborating on the FILMskin project with Joycelyn Harrison and Cheol Park, both of the National Institute of Aerospace in NASA's Langley Research Center. The ORNL researchers' task is to develop material that matches real skin's thermal properties and, then, a temperature sensor, whereas NASA's task is to develop advanced pressure sensors. Together, the two organizations will produce a one-inch-square patch of a lightweight, durable FILMskin composite of a polymer and carbon nanotubes, which will exhibit multifunctionality not possessed by current prosthetic coverings. The complex makeup of warm human skin is revealed in a thermal image of the hand, which displays different colors indicating different skin temperatures. "By exploiting carbon nanotubes' ability to conduct heat, we will create nanocomposites with the thermal conductivity of muscle, fat or skin. We recently showed that, with only 8 volume percent of nanotubes, we can make a polymer composite with a thermal conductivity that far exceeds conductivities of different tissues." After creating thermally conductive polymer patches, the researchers will incorporate an array of vertically aligned nanotubes (VANTAs) to conduct heat quickly in the direction of the nanotube alignment to temperature sensors. Ivanov recently demonstrated that a heat pulse travels 20 times faster in a polymer containing VANTAs than in a pure polymer, indicating that the time response of temperature sensors positioned under the skin can be greatly improved. The next step is to design sensors that detect temperature and pressure differences in FILMskin. Nanotubes could be used for temperature sensing because their electrical resistance changes when exposed to temperature changes. NASA's Park has shown that nanotubes can be dispersed in a novel biocompatible polyimide material and is now working on making the nanocomposite more responsive to pressure. The researchers know about pressure. Says Ivanov: "DARPA wants to move really fast from basic research results to implementation of the concepts it selects.